Obituary for Marie D. Wienke | Rhoney Funeral Home, Inc.
Marie D. Wienke, of Sanborn, NY, passed away on Monday, August 13, 2018, in Our Lady of Peace Nursing Care Residence. She was born in Los Angeles, CA, on January 27, 1938, the daughter of the late Cecil and Esther [Mueller] Strehlow. Marie moved to North Tonawanda in the 1940's with her family and graduated from North Tonawanda High School. She worked in the Melody Fair box office and sports box office at Niagara University where she became the payroll clerk in the Human Resource Department for 23 years, before retiring in 2002. Marie was a founding and long time member of Abiding Savior Lutheran Church in North Tonawanda where she served faithfully as an organist for 49 years. 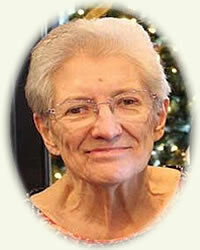 Her love of music was shared with many through choir, Sunday school, vacation Bible School and instrumental duets. She helped start and participated in many of the church women's organizations. Marie was the first crossing guard for the West Street School in Sanborn and a dedicated charter member of the Sanborn Historical Museum. She is survived by her husband of 62 years Glenn L. Wienke, three daughters Karen (Bryan) Richardson, Kathy (Rob Sobczyk) Richardson and Kris (Rick) Schrader, six grandchildren Craig (Ashley) Richardson, Julie (Kyle) Stevener, Michelle (Lance) Rolston, Kimberly Richardson, Brittany (Christian) Nole and Brandon Schrader, three great grandchildren Alexis, Natalie and Jackson, a brother Donald (Clara) Strehlow and a sister Donna (Tony) Ventresca, also several nieces and nephews. Her family will be present on Friday from 3-7 PM at the RHONEY FUNERAL HOME, 5893 Hoover Road, SANBORN, NY. A memorial service will be held on Saturday at 11:00 AM at Abiding Savior Lutheran Church, 1534 Ruie Road, North Tonawanda, NY. Flowers are gratefully declined. Memorials may be made in her name to the Abiding Savior Lutheran Church. Interment in Acacia Park Cemetery, Town of Pendleton, NY.